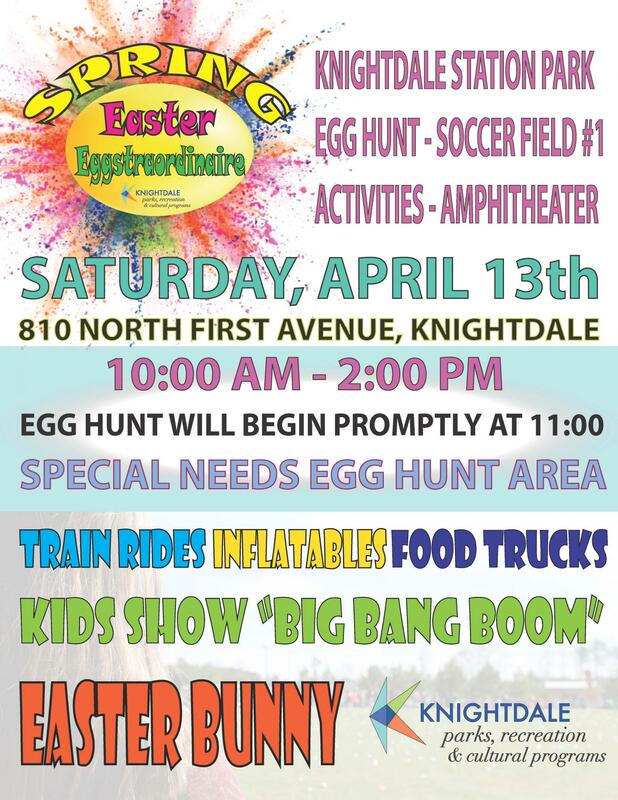 The 2019 Knightdale Spring Sprouts Easter Eggstraordinaire is the Saturday, April 13th. We offer 3 Easter Egg Hunts for ages 0-3, 4-5, and 6-8. We will have a separate area designated for a special needs egg hunt. The hunt begins at 11am sharp! Hunt for eggs, take photos with the Easter Bunny, grab a snack and enjoy live children"s performance by Big Bang Boom, inflatables, food trucks, and activities, including train rides! Activities and music will be available from 10:00am-2pm. The egg hunts will be located on the soccer field 1. All activities will take place in the grassy area at the amphitheater, the stage and under pavilions. There will be signage to designate the ages assigned to each area. Remember your basket for this event! Hop on over, this will go on rain, shine or cold weather. Reminder: Please allow children to hunt for eggs on their own! If a child is unable, please limit assistance to 1 parent per child (if necessary).